I love bagels. I grew up in a city where there were a ton of delicious bagel shops. In fact, one of my friends worked at a bagel place and he used to bring me a huge bag of bagels after his shift some nights. I really looked forward to that because if there is anything better then bagels, it’s free bagels! My favorite bagel is the salt bagel. It’s simple but delicious. My favorite way of eating it is with vegetable cream cheese. Pure bliss! My second favorite type of bagel is Jalapeno Cheddar. I love the melted cheese on top and the spiciness of the jalapenos. It’s awesome. However, I’ve made both of these bagels in the past so I didn’t want to make them again. I wanted to try something different. 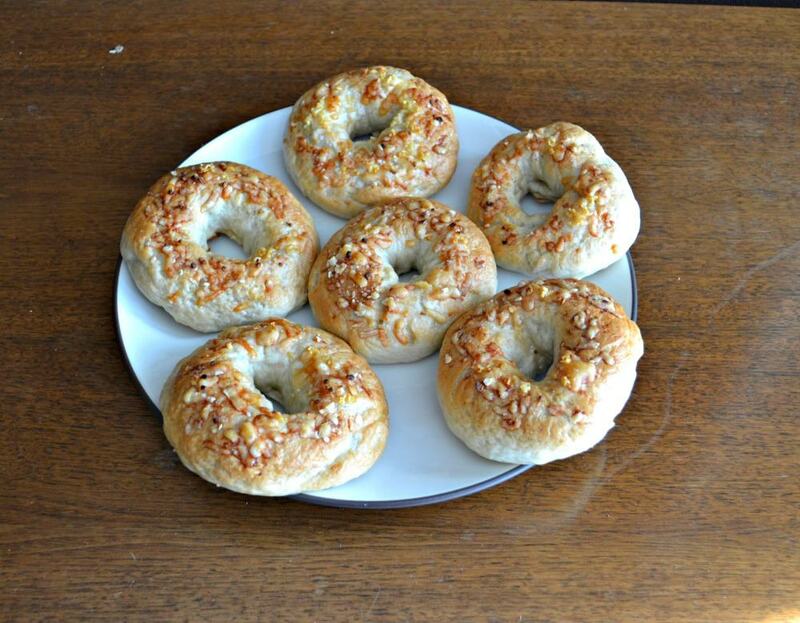 I found these Quick Parmesan Garlic Bagels are pretty easy to make. They rise for 1 hour the first time and 30 minutes the second time. That’s it! 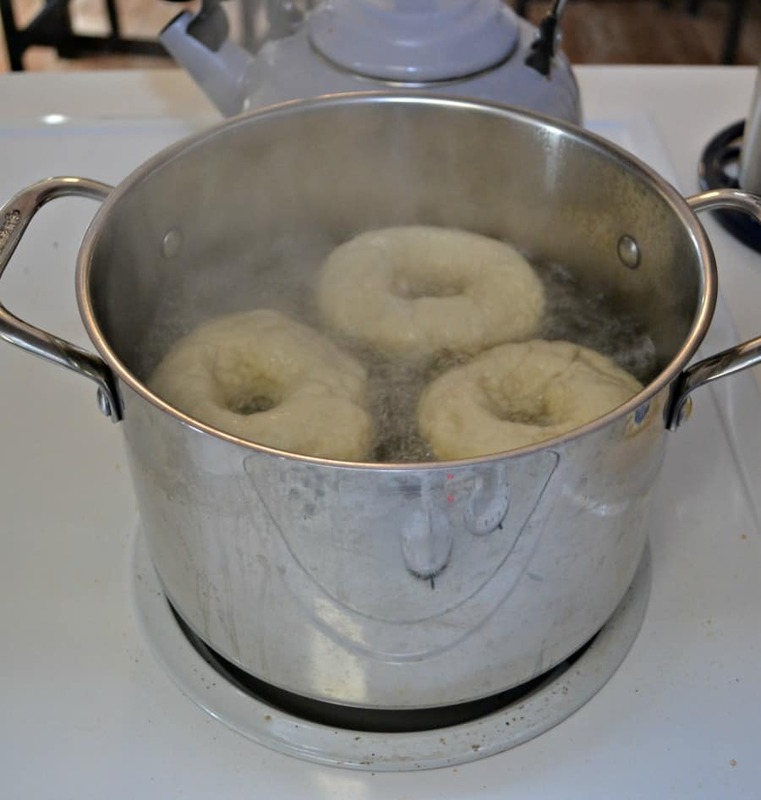 The bagels are made in the traditional way of boiling them, putting on the topping, and then baking them. They come out golden brown and delicious. The cheese and garlic get crispy and taste amazing. 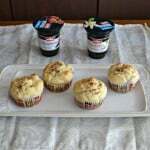 They were great for breakfast with cream cheese or for lunch as a sandwich. 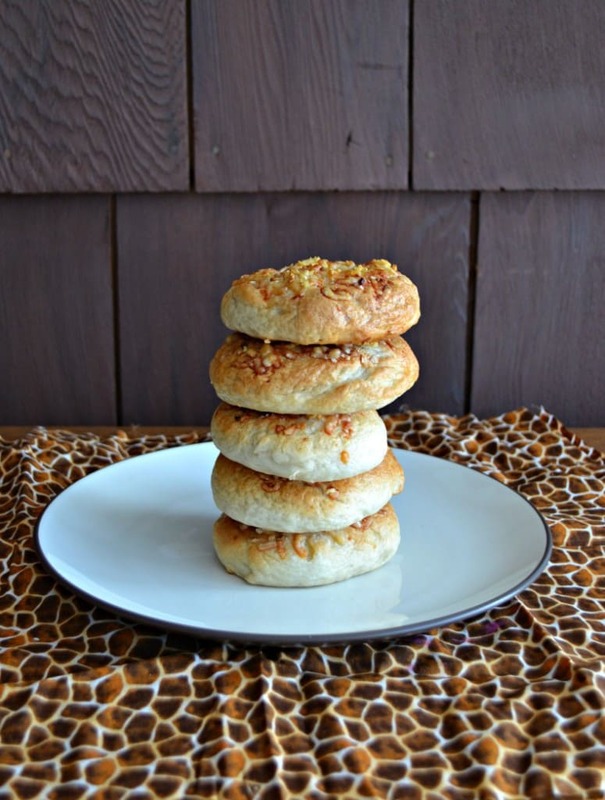 Easy Parmesan Garlic Bagels are flavorful and taste delicious! In a large bowl combine the warm water, yeast, and honey. Let sit for 5 minutes or until bubbly. Add in the salt and 3 cups of flour. Mix until combined. Add the remaining flour a half cup at a time until a smooth dough forms. Knead until the dough becomes elastic then place in a lightly greased bowl to rise until doubled in size, about one hour. After it has risen, punch down the dough and divide into 12 equal pieces. Roll each piece in a ball and place on a greased baking sheet. Cover and let rise for 30 minutes. 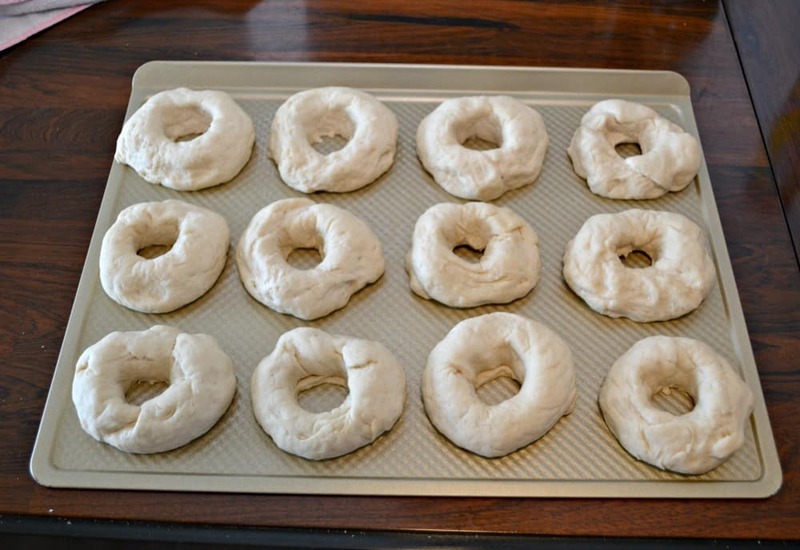 After 30 minutes, poke a hole through the middle of each bagel to make the classic bagel shape. Bring a large pot of water to a boil and add the brown sugar. Add the bagels 2 at a time. Cook for two minutes then flip over and cook an additional minute. Remove from the water and place on a greased cookie sheet. 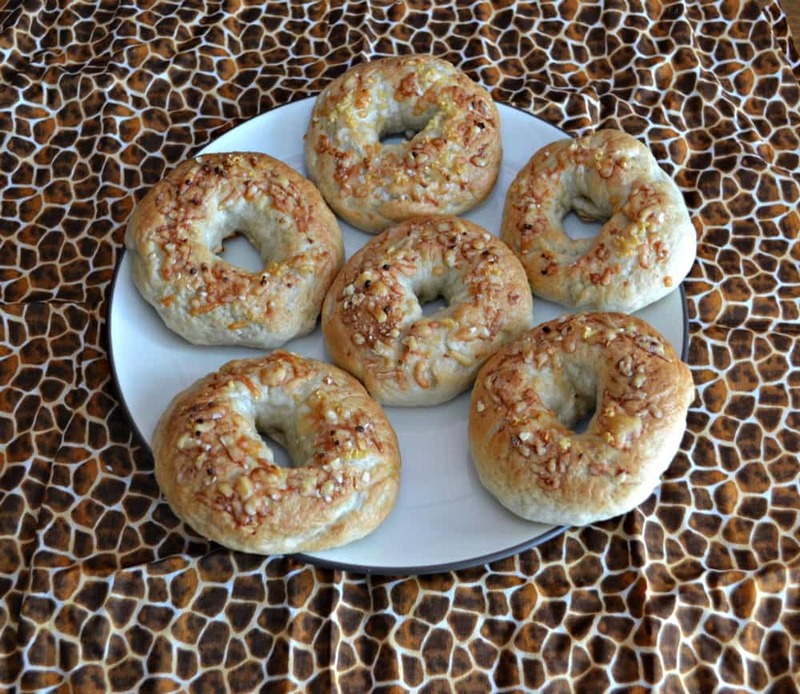 Sprinkle the wet bagels with grated cheese and sea salt, lightly pressing into the bagel. Bake for 20 minutes. 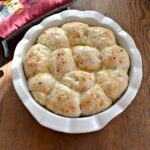 Remove from oven and sprinkle the bagels with the garlic cloves and bake an additional 7-10 minutes or until the cheese is golden brown. I could see eating these bagels with veggie cream cheese. They look wonderful. 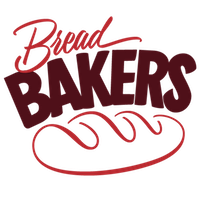 Thanks for hosting this month’s Bread Bakers! THank you so much for hosting this month. I know it was a lot of work and I appreciate all that you do. Your bagels look scrumptious! Thank you so much for hosting this month, Heather! I really enjoyed this challenge! 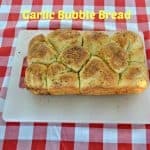 Garlic and Parm? Great combination–I’m in! I was just writing on Stacy’s post how my two favorite bagels currently are roasted garlic and a parmesan pepper one. This combines both, how perfect! This may be my favorite Bread Bakers month so far, Heather! I love all the different bagels everyone has baked. So great to see how different bakers approach a challenge. Thank you so much for hosting. You made me laugh, but you are right. The only thing better than a bagel is a free bagel. 🙂 Yours came out perfect, with all that cheese on top. And the garlic! Serious perfection! I can pratically smell one of those gorgeous bagels toasting in my kitchen. They look great! I love all these bagel recipes you guys are sharing!! 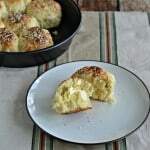 I’ve never had Parmesan on a bagel though – will have to give these a try (I love making bagels – they’re so easy once you figure out what you’re supposed to do!). Thanks for sharing!! Thanks for hosting this month, what a great theme! It is one we all enjoyed. I would love to have a sandwich for lunch with your bagel today, love the cheese! I’m a garlic junkie so I absolutely know I would love these bagels. I want to smear garlic goat cheese all over these! Thanks for hosting, Heather! I could definitely eat a lot of these! 😀 They look perfect. And garlic and parmesan. Mmm. Thanks so much Heather for hosting! These sound and look amazing! Love the photos!